Over the past decade, as airborne gravity data acquisition and reduction has become increasingly refined, its usage by academic, industrial and government researchers has expanded. Recent data collected jrom a Cessna 404 over water and a ski-equipped Twin Otter over a grounded ice sheet, have demonstrated that airborne gravity can recover anomalies with wavelengths greater than about 5 kilometers to accuracies of better than 3 mGal. The Cessna 404 was used over the Long Island Sound off the East Coast of the U.S., a region with extensive marine and land ground truth. The output from the Bell Aerospace BGM-3 was reduced with psuedorange GPS positioning from a Trimble 4000 CA-code receiver and with vertical positions and accelerations from a radar altimeter. The Twin Otter experiment was flown over the West Antarctic Rift system, where limited ground truth from surface gravity data exists that was collected in the early 1960’s. The navigation in this experiment included CA-code and P-code psuedorange solutions, differential carrier phase positions, radio transponder locations and pressure altimetry. Base stations were used for the differential GPS and pressure altimetry. 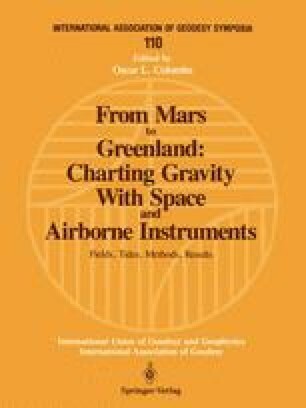 The results from an overflight of a traverse gravity line indicate that even in this remote location airborne gravity can recover anomalies with accuracy adequate for geologic studies. The current level of resolution and accuracy from airborne gravity is adequate for tectonic studies and deciphering the history of sedimentary basins but it falls short of the high resolution required for detailed studies of intrusive features, hydrothermal deposits and other small, yet important, geologic features. To increase the accuracy and resolution of the airborne measurements utilizing the current systems requires improved positioning systems, stabilized platforms and improved sensors. Gravity gradiometry may also prove to be an important technique as it eliminates some of the stringent requirements for high resolution navigation.